Congratulations to the winner of our Client Survey draw! 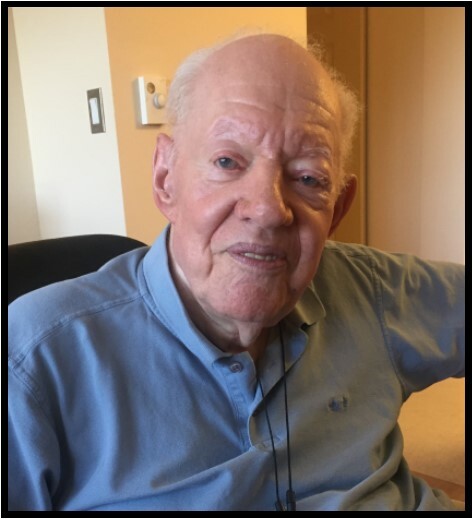 Mr. Fred Thorpe is a veteran of the Second World War, has a doctorate in french colonial history, and has been one of Meals on Wheels’ valued clients for over 12 years! Mr. Thorpe settled in Ottawa in 1953 following his military service, and was one of the few soldiers listed for employment with Veterans Affairs. During a longstanding career which took Mr. Thorpe all across the country—including Louisbourg, Quebec City, and Winnipeg—he was tasked with developing a new history division within the various Canadian museums. 25 years later, Mr. Thorpe retired on the day of the opening of the Canadian Museum of Civilization (now Canadian Museum of History) on June 29th, 1989. After over a decade of retirement, Mr. Thorpe lost his wife in December of 2001. The couple had often joked that he taught her how to broil but then completely forgot it himself when she took over [the cooking]. After 3 years of relearning to cook his own meals (while also growing tired of restaurant food), Mr. Thorpe registered to receive Meals on Wheels. As a client of the frozen delivery program, Mr. Thorpe finds he eats meals that are of much higher quality than he could ever produce himself, and spends significantly less money than he had as a consistent restaurant-food consumer. Some of his favourite dishes are Tourtière Meat Pie and Bangers & Mash from the Apetito menu, while the TimeSaver Foods’ Cabbage Rolls fulfill his appetite for the Ukrainian dishes his wife had often prepared for him. Mr. Thorpe plans to use his ten free meals to treat some friends for lunch-on-him! Thank you Mr. Thorpe, and to everyone who completed this year’s client survey. Your feedback helps us to continuously improve our service. Until next year!